Delhi to Hyderabad By Road - Road trip - Part 1 - Ghumakkar - Inspiring travel experiences. I was transferred to Hyderabad from Delhi. Initially it was for a month as I had to stay at Hyderabad and then fly for an onsite location, but due to some personal issues I had to refrain from immediate travelling and was supposed to be at Hyderabad for another six-seven months. Initially I had come alone to HYD and staying at an services appt, as I was supposed to be there for just for a month, but now as the stay had to be extended I had plans to relocate to HYD, but as it was for a short term, I was not much keen on relocating all my household stuff and things from Del to HYD and after six months move again. So This time I arranged for a fully furnished house in HYD, and planned to move only the necessary items and my vehicle to HYD. Planning this I had a discussion with a few packers and movers who were quoting a high price for the items I had asked. On further probe I found that it is majorly due to car relocation, as from Delhi, the transporters have an option of carrying cars from Maruti Suzuki, and hence if they have to carry personal cars they charge more than the stipulated factory rates. On checking the current options I struck an Idea of why not drive down my car from Delhi to Hyderabad, and carry the household stuff with me as well. Well It was a mentos Idea for me (Dimag ki Batti Jala de), but for my family it was a mad idea, driving alone for more than 1500 Kms on the roads that are notorious especially the MP and Maharashtra/ AP Naxal area. But not this was something which was satisfying my needs of transporting my things to HYD and above all my urge to Drive !!! Made some final preparations and made an itinerary of reaching Hyderabad in 2.5 Days with night breaks at Sagar and Nagpur, and accordingly made the route chart and all. I booked my flight tickets from HYD to DEL for 1st Feb 2013, and had a plan of starting from Delhi to Gwalior on evening of 2nd Feb and start my further journey after that. I had a morning flight from Hyd, which got delayed due to bad weather conditions in Delhi and Instead of reaching Delhi @ 11 AM, I reached there @ 5 PM. This was too much for me as it had taken a toll on my plans as I was supposed to spend the time with family and make sure the car is in good condition (was not driven much since past 1 month). Now I reworked on my plan, and decided to stay in Delhi on 2rd Feb and instead start in early morning on 3rd, though it was against my initial plan of avoiding early morning drive from Delhi due to fog, but commitments matters !! So I was at home on 2nd and started my Journey at 5:30 AM on 3rd Feb. I had an idea that though fog would be present in the area, but it is not much of problem till the dawn breaks, when the visibility becomes poor as the sun rays refracts with the misty air and creates foggy conditions. Due to this I opted for the NH2 Badarpur>Palwal>Mathura>Agra instead of Yamuna express way as I was sure that due to more vehicle movement esp trucks and all I can follow a trail if there are extreme conditions. 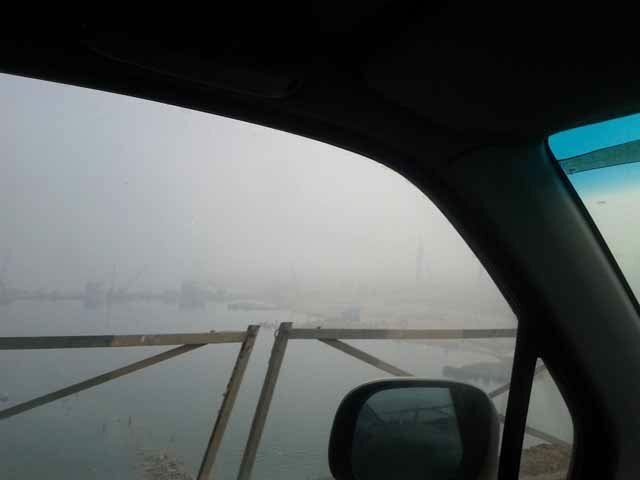 I crossed Badarpur at 5:57 and reached Srinagar Toll Chowki @ 6:43 and by this time the fog had already built up, and my average speed was reduced to around 35 KMPH instead of 70-80 in the Delhi Agra stretch. Most of the vehicles were stalled but I carried on as I had to cover a lot more distance than Delhi Agra. 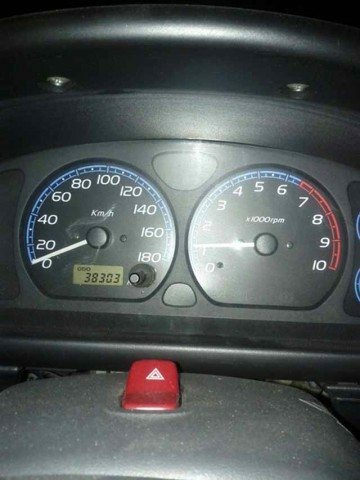 The only thing worrying me at this time was the trucks and fear of mass collision as the visibility was low, but may be due to low speeds maintained by all, it was safe. Reached Mathura (Mahuvan Plaza) at 8:35 and proceeded to Agra in the same foggy conditions. Found the cut to Gwalior on Agra Bypass, but it seems people at Agra have some issues with road signage. It was written to take a ‘U Turn’ while there was a road going on the immediate right. I took a U turn and asked for the road, and the person told me that you have left the cut. Any ways I came to know that though this road goes straight to Dholpur, but due to current construction work going on for a bridge I was suggested to go 4 Kms further and then take a right turn for Dholpur. Again the ‘U turn’ signage but I had now managed to negotiate. There was a small railway crossing on this road and as per the Murphy’s law I had to wait for the train. Once the train passed, I started again and searched for Gwalior Road, but it was not found any where as all the road directions were given keeping Jaipur in Mind. 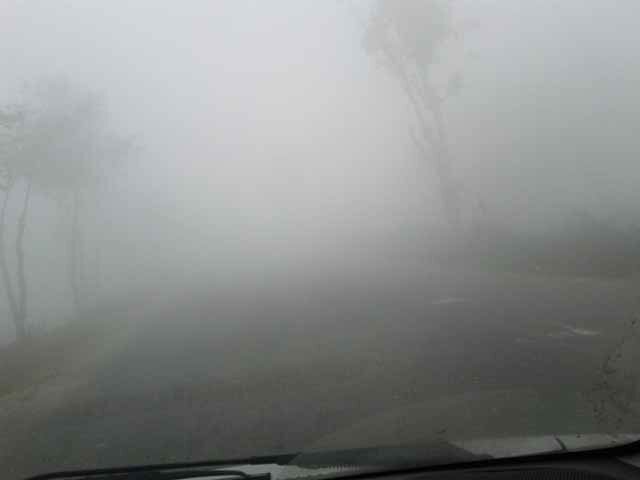 Any ways with the help good Samaritans I was able to locate the road, but the fog kept on taking the toll of my time. 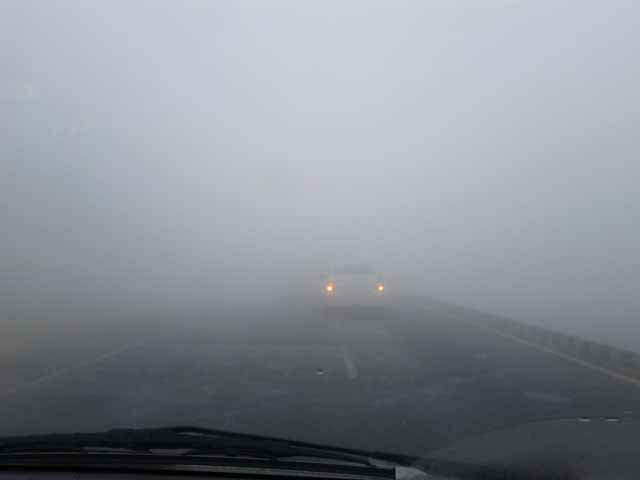 The road from Agra to Gwalior / Dholpur Highway is running parallel to an irrigation canal, and due to this the fog was so much that the visibility had now gone down to zero. At times I was driving car by taking my head out of window (remember Jim Carrey in Ace Ventura), as the windshield was getting misty. After spending much time in searching I finally reached the highway and headed straight towards Dholpur my next milestone. 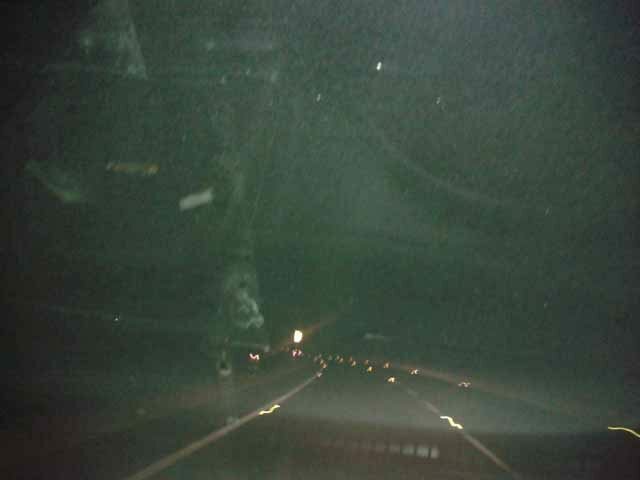 The roads were good, infact better than the Del ~ Agra stretch, and I reached the Baretha Toll @ 10:29. As all the good things, the road also ended and the stretch from Dholpur towards Morena was bad. 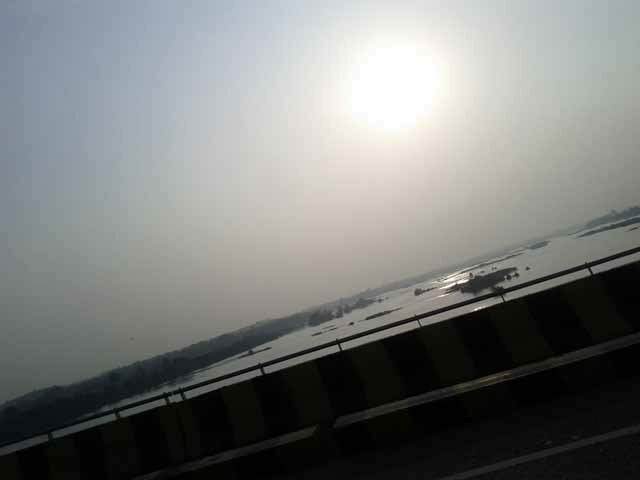 There was a small jam before the Chambal bridge but then I was able to manage the speeds. Once I crossed Morena a hustling small town in MP, the roads upto Gwalior were more or less good and the journey was more or less smooth. Though the roads were good and I could have easily driven 100+ on it, but I refrained and kept my speeds steady 90-100, as I had to drive a long distance and was not in favor of straining the engine much. Once I reached Gwalior I was on AB road which was showing the directions to Shivpuri, and I had to go to Jhansi, I was not sure if the AB road hits Jhansi Road or not, so I entered the Gwalior City and searched for Jhansi Road, after some uneventful tries I finally found the Jhansi road going from beneath a fly over, and hit the highway again. The complete road from Gwalior to Jhansi around 100 Kms was in a bad condition. Though some stretches were good and they had Tar over them, but the diversions were real bad and there were places where no roads were present at all. I had read about the road conditions but still took the road as I was sure it won’t be much bad, but it came out to be worse. I was afraid of my suspension taking the toll and wheel alignment going wrong. I have driven on bad roads, and even non existent roads, but this was different, worst of all the roads till. After this uneventful drive upto Jhansi @ 3:30 PM, I stopped at a small hotel and had my lunch and started the next leg of my journey upto Latitpur. I had heard that the roads after Jhansi are good and Lalitpur – Sagar was a great road. So I geared up for this stretch by filling up the car at Jhansi – Babina road. Roads upto Babina are not great and sudden potholes surprise you. Reached Babina at around 4:30, but a nail had hit my rear tyre and it suffered a puncture at Babina Market. As my car was full of loads and I didn’t wanted to change the spare wheel so searched for a puncture repair shop, and found it around 150 mts from there. Got the tyre repaired, as I wanted to keep the spare for an unfortunate moment if I get stranded in the middle of nowhere. After 15 mints I was ready to go. Double checked the tire pressure in all the wheels if any of them were loosing it, and then started the journey again. After covering around 2 Kms from Babina, I was welcomed by Lalitpur – Sagar Road, and now already frustrated by the roads from Gwalior upto here, I loved this road to drive. The road conditions were really good looked like the same good roads from Krishnagiri to Chennai. Smooth 2 Lane Highway. I had initially planned for stay at Sagar, but the roads were inviting and on the Highway I missed the entry into Sagar town, so I thought of stretching the limits and reach the next town which I hit. It was already 7:30 and it was dark all around, stopped at a roadside Dhaba for my dinner and enquired about the roads ahead and the general safety in the area, once assured, I took a decision to venture ahead and reach Narsinghpur which was another 150 Kms from Sagar. The Road till Narsinghpur was not complete fully and had a lot of diversions in between with non existent roads. As I had my last petrol filled at Jhansi, and I was planning to start early morning from my stoppage to Nagpur, I had to get the fuel filled so that I have a tank full in the morning. Before Narsingpur I passed a small town of Kairali and found a good petrol pump. I normally don’t fill my tank at any petrol pump and would normally check about the quality even though I may travel some more distance for it. Even in my city I won’t fill the fuel at the neighborhood pump but would go 5 Kms ahead to get the fuel from the reputed pump for which we have assurance that the quality is good. But as this was a Highway and I don’t know about the whereabouts, I checked for the biggest pump. Rest in my next Travelogue. A terrific start, I must say…a road journey attracts me always and love to read more and more such posts. Look forward to next part and many more from you. Trip across 4 states was very interesting. Thanks for the details in terms of road conditions/ timings, etc. I would have opted for Yamuna Expressway because it is a double road have excellent signages. Have you driven on this road before ? If not then please try it when you get time and opportunity. The NH2-NH3 connection seem to have gone bad again. And Gwalior-Jhansi would probably never get better. Kudos to never die attitude and look forward to next leg of journey. Please respond to comment as your time permits. Wishes. 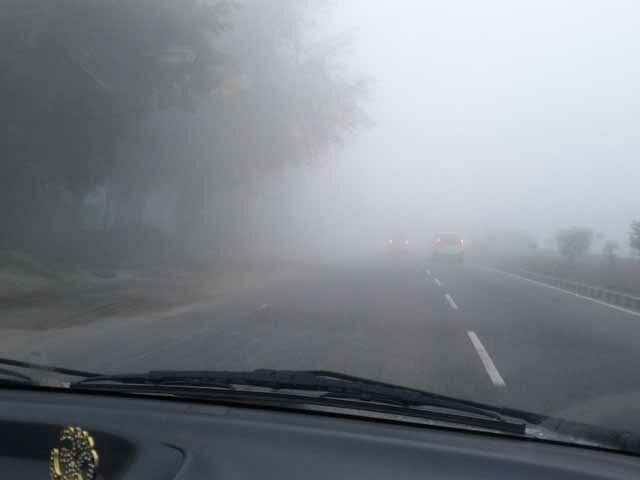 I had done this trip on 3rd Feb, and on those days, complete north India was covered with fog. due to less vehicular density and open fields, YE is more prone to thick fog and on 2nd Feb itself there had been a serial collision of 6-7 cars in this route, that is the reason I had chosen the DEL Agra NH 2 Route (explained in the T’log). I have driven on YE and it is a good road, infact best road in the region, but one relishes this road truly with a bigger car with much more displacement. Now I have heard that there are speed restriction of 100 KMPH in place on YE which does not justify the road. After this much lamenting, I must say that I was filled with so much curiosity of ‘what next?’ that I kept reading and reading and reading ! If you would take care of some proof reading before finalizing the draft, it would make the blog simply mind-blowing. Thanks for the comments, Personally I think it is NHAI, that is making people to drive across the country. The road conditions has surely improved a lot than the past decade and with technology keeping up with times and more reliable machines people can venture out more. The first step is always the hardest step. Thankfully one of my flatmate Vikas agreed to come with me (on his Avenger !! ) upto Agra to see the Taj and then he would return back to Gurgaon . We didn’t pick the Yamuna expressway since if you are planning to go Agra from Gurgaon, taking AH1/NH2 through the Sohna Road is always a better option. It prevents you from passing through Delhi traffic, plus no tolls to pay like that on Yamuna Expressway ( and no more tyre bursts !!). The road is pretty good upto Palwal, 50km from Gurgaon, from there AH1 meets NH2 which directly takes you to Agra. Although it was mid April, somehow it started raining around 7 AM and weather became very pleasant, what else a rider could ask for !! We stopped for chai sutta on two occasions and reached Agra by 10 AM. After entering the Agra city , it took us around 1.5 hrs to reach the Taj because of small roads and heavy traffic although it was only 13 kms from the highway. 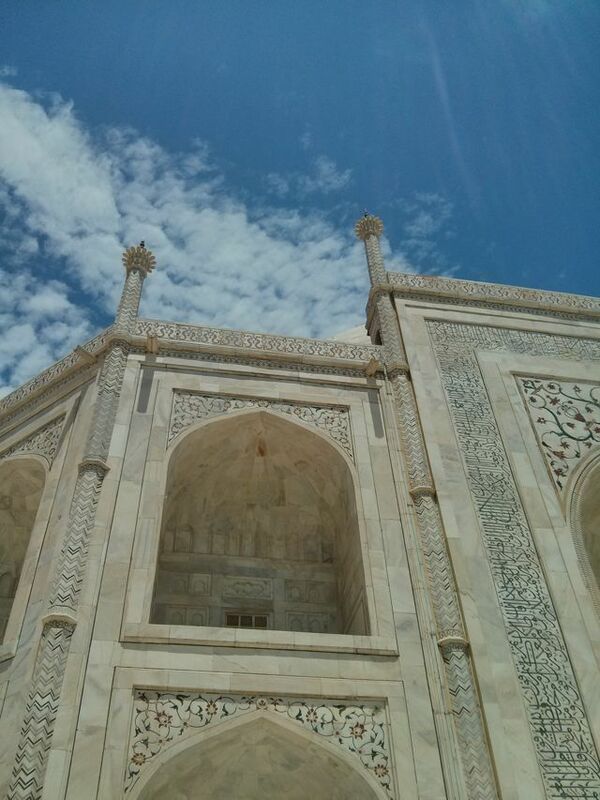 Anyways seeing the magnificent Taj and Agra fort was quite refreshing. Now my roomy Vikas had to go back to Gurgaon and I had to cover the rest part of my journey alone. I was up for it.